Designed for educational use, this game originated at the psychology department of the University of California Davis. Chairman Robert Sommer and Judy Tart wanted to give middle-class whites a taste of the helplessness that comes from living against implacable odds. Players who chose to be black could not win, or seriously affect the course of the competitive thing going on between white players. 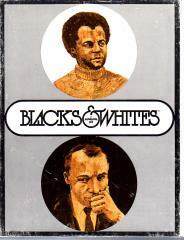 Blacks & Whites is a standard property buying game that can be played by 3-9 players and each player may chose to be white or black. The black players start with 10,000 in cash, collect less money with each trip around the board and can only buy property in certain areas while the white players start with a 1,000,000 and can buy property anywhere.